Secluded on a stretch of unspoiled shoreline, this resort occupies a 12-acre private peninsula. Amenities include pools and waterslide, full kitchens, two European spas, a kid's club and four restaurants. Authentic native art and Mayan-inspired architecture add a distinctive flavor to the many amenities offered, like beautifully furnished guest suites, and the PGA 18-hole El Tigre Championship Golf Course and Country Club. 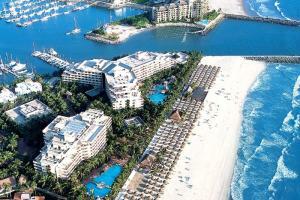 On Banderas Bay in Nuevo Vallarta, 20 minutes from downtown, 10 minutes north of the airport. Tulum Restaurant, Mayapan Restaurant, Mayapan Bar, and Kabah Sports bar. 18-hole golf course nearby, Paradise Plaza Shopping Center, Banderas Bay, Deep Sea Fishing.